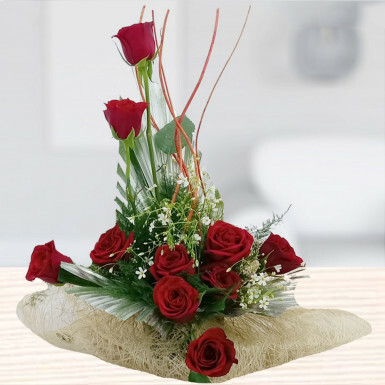 At Winni, we bring a “Hued with Beauty” - a beautiful floral arrangement which is made from red roses with Jute, dry sticks and talpati that will surely add the majestic magic into your relationship. Either is the time of your sweetheart’s birthday or your wedding anniversary or any special occasion of your dear ones, you can gift send this floral beauty from Winni. It can be an ideal gift for them which will melt heart immediately. Believe us, there is nothing better than this to bring a sweet smile on the faces of your dear ones. So don't think anymore and place your order online right now!